People with diabetes are twice as likely to have a heart attack or stroke, according to the National Institute of Diabetes and Digestive and Kidney Disorders. Controlling blood sugar and lowering blood cholesterol levels can reduce the risk. A healthy lifestyle, including physical activity and healthy diet choices, can help improve both blood sugar and cholesterol levels. A low-cholesterol diabetic diet controls carbohydrate and limits saturated fat intake. Diabetes is a metabolic disorder characterized by high blood sugars. Carbohydrates in foods, such as starches, fruits and milks, cause elevations in blood sugar. To control blood sugar and limit risk of heart disease, people with diabetes need to control the amount of carbohydrate consumed at each meal. 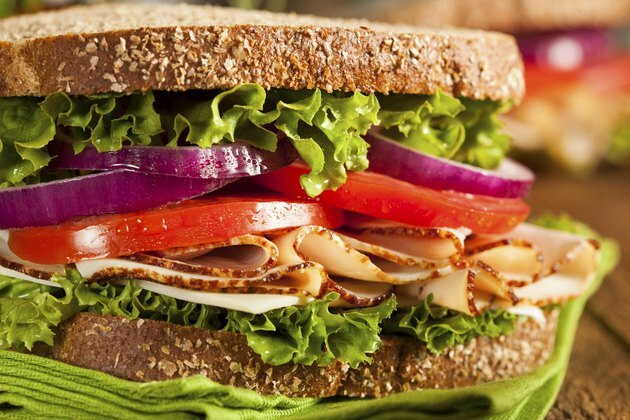 On the carbohydrate-counting diet, the American Diabetes Association suggests consuming 45 to 60 grams of carbohydrate at each meal. Breakfast meal suggestions for a low-cholesterol diabetic diet include 1/2 cup of cooked oatmeal, 1 cup of skim milk and 1 small banana; 1/2 cup of egg substitute, two slices of whole-wheat toast with 1 teaspoon of margarine and one small orange; or two whole-wheat pancakes with 2 tablespoons of light pancake syrup. Diets high in saturated fat increase blood cholesterol levels. 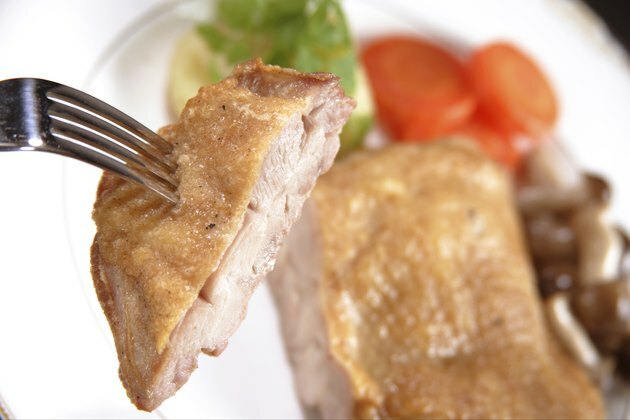 Animal protein and fats are the primary sources of saturated fat in the diet. People with diabetes should choose lean cuts of meat and low-fat and fat-free dairy products to limit their intake of saturated fat. Lunch meal suggestions for a low-cholesterol diabetic diet include 2 cups of low-sodium, broth-based soup, five whole-grain crackers, carrot sticks and one fat-free string cheese; a turkey sandwich on two slices of whole-wheat bread with mustard, lettuce and tomato, a container of fat-free, sugar-free yogurt and a tossed salad with fat-free salad dressing; or a spinach salad with grilled salmon, 1 cup of fresh fruit, one small whole-wheat roll and a container of fat-free, sugar-free yogurt. 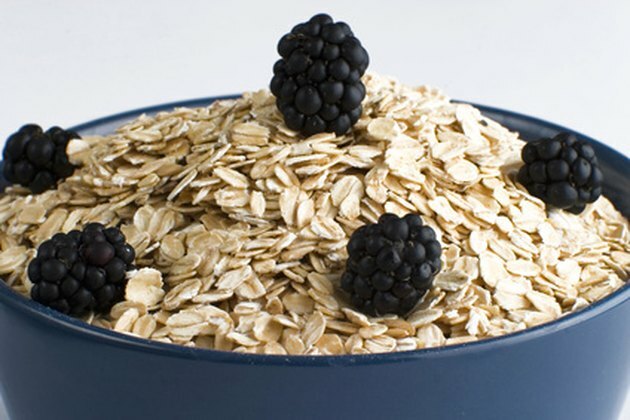 Soluble fiber helps to lower cholesterol and aid in blood sugar control, according to Joslin Diabetes Center. 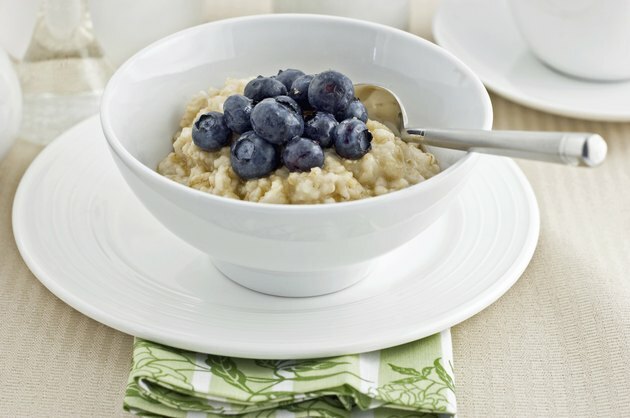 Foods high in soluble fiber include oatmeal, barley, brussels sprouts, kidney beans and pears. Dinner meal suggestions for a low-cholesterol diabetic diet include 3 ounces of roasted chicken breast, 1 1/2 cups of roasted potatoes and 1 cup of roasted brussels sprouts; 2 cups of chili made with kidney beans and soy crumbles or lean ground beef, 1/3 cup of brown rice and a tossed salad with fat-free salad dressing; or a 3-ounce serving of London broil, 1 cup of corn, 1/2 cup of mashed potatoes and a tossed salad with fat-free salad dressing.